Student visa France - How to get Apply? Overseas education, in a modern era, is opening up to the whole new horizons. There are seemingly endless benefits one may consider while opting for studying abroad. Many countries are adopting courses that can help students get a job that is internationally acclaimed. If all the instances people have already heard about France were not plentiful, what if they were apprised that the country has one of the most well-respected education systems in the world? For that matter, getting a student visa in this country is not so complicated process. 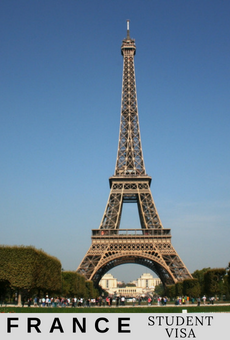 Are you eligible for the French Student Visa? Generally, if you are a citizen of one of the European Union (EU) or European Economic Area (EEA) countries, you will not need to apply for the French Student Visa. All you need is to have a valid passport of that country or any of the travel identities. However, if you belong to anywhere else in the world, you will need to have a visa for studying in France. Students who want to apply for short courses, long courses, language courses, internships and any other valid existing course can apply for the visa. Which category of "French Student Visa" will you fall under? Schengen student visa/court sejour pour etude - In case you want to study in France for less than 3 months, you will need to apply for ‘court sejour pour etude’ or ‘Schengen student visa’ or commonly known as ‘Short-stay visa’. This visa is issued at free of charge for the citizens of EU and EEA by the French Government whereas, for all other applicants it has a processing fee of € 60. The visa holder cannot renew it. Opt for this one only if you have completely made up your mind that your course is not going to last more than 90 days. However, a valid USA passport holder is not charged with visa fees for this category. Visa for entrance exam/visa de court sejour etudiant concours - This visa is issued to the students who want to attend any entrance exam in France. In case you pass the entrance exam, you will become an eligible person who can apply for a renewable visa that will last for another one year. This will be your residence permit for this duration and you can apply for it concerning the institute or university you want to study at. Temporary long stay visa/visa de long sejour temporaire pour etudes - This visa is valid for a period of up to 6 months. If you get this visa, you will no longer to apply for a separate resident visa. Long stay visa/ visa de long sejour pour etudes - This is the visa you will need if you wish to study in France for more than 6 months. In general, students apply for this visa only if they are going to opt for longer term courses in any of the public or private institutions of France. How to apply for a French Student Visa? Through ‘Campus France’ - the country's official agency for higher education and overseas students - one can apply for the student visa in this country. Firstly, it’s mandatory for the applicant to fill an online application form on Campus France website where this agency will validate the applicant’s dossiers. Once validated, the applicant will be informed to proceed further. An official letter of acceptance from the French institution noting the accredited program or course. This letter must contain your full personal details, the detail of the course you want to opt for and the start & end dates of the course. Proof of adequate funds for living in France. Currently, it's € 615 per month that can be presented with a bank statement, a proof of scholarship - if any, or funds taken through a loan. Proof of your medi-claim which amounts minimum of € 30,000. Proof of your living in France. A document can be submitted in form of certificate from student housing board or if you are living with friends and family, you need to show ‘attestation d’accueil’. Proof of ‘French language proficiency’ if you are opting for French language course. It’s worth mentioning here that the most of the student visa requirements are mostly similar from consulate to consulate still while applying for the visa, the applicant must check the actual information and requirements from respective country’s consulate’s website. Furthermore, the applicant must be present in person at the consulate’s office to submit biometrics at the time of visa procedures. Additionally, upon arrival in France, the visa holder will need to present before the French Office of Immigration and Integration (OFII). Here, he/she might have to pay a tax of € 58 inclusive of all administration costs. How long would it take to get the visa? Generally, the Campus France process takes somewhere around 3 weeks, whereas the consulate process takes approximately 2 weeks. Overall, the whole visa process will take a minimum of 90 days. Thus, it is strongly advisable that students should get the process done in the earliest possible time span to avoid any unwanted bottlenecks in the further process. If at any point of time the visa holder gets stuck, he/she must check the issue directly with the consulate. If the issue persists, the institution advisor of France can contact the consulate to rectify the problems.